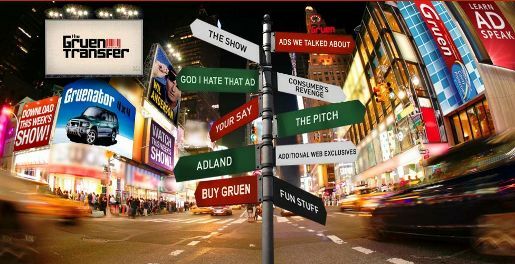 The Gruen Transfer is back for a third series. The Australian television series, aired on ABC, explores the world of advertising, dissecting television commercials, challenging local agencies to respond to creative briefs, and inviting the public in to online conversation. Comedian Wil Anderson is joined by a panel of Australian and New Zealand creatives, Todd Sampson, Russel Howcroft, Bram Williams, Bridget Taylor, Carolyn Miller, Dan Gregory, Dee Madigan, Jane Caro, Matt Eastwood and Rowan Dean. The first episode explored the theme of house cleaning, along with an analysis of the Mineral Council and Australian Government’s respective campaigns on the proposed super tax. The pitch, between BWM Sydney and Junior Brisbane, focused on the plight of the ugliest sea creature in the world, the endangered Blobfish. The first episode opened with the question of Hitler. Is it appropriate to use Adolf’s image in advertising. See our articles on Hitler’s role in advertising: WPTT condoms, Hut Weber hats in Germany, Luxor highlighter pens in India, Nulaid eggs in South Africa, 92 FM in Greece, and NOAH’s anti-fur campaign in Germany. The first episode included a feature on the ethics of cleaning advertisements. When is it OK to play on the insecurities of women concerned about the state of their homes? Bamercise and the Ajax woman. See our article on the banned/withdrawn Shiny Suds shower campaign by Method, the People Against Dirt. It appears as though the Global Financial Crisis has led to either a surge in nostalgia in our advertising, or just plain recycling, as we see the return of Ajax, Pro Hart carpet stunts, Pantene and the Smiths Gobbledok alien. Junior Brisbane‘s campaign to save the blobfish won the Pitch award on the night, after a casting vote from the Gruen Transfer production team. Instead of producing a commercial, as in BWM’s Dove Evolution style ad), they took to the streets and pavements of Sydney to motivate the public to do something. “Given the Blobfish is such an unattractive, lazy, miserable looking beast, it’s pointless asking Australians to care about the problem. But you can make it their problem. Get right up in their faces in all our fugliness and promise to leave them alone if they make one simple gesture.” The campaign is online at www.fugli.net and on YouTube. The third series includes the search for the worst ever television commercial. The first contender is a four minute introduction to the ill-fated Microsoft Research SongSmith software released in 2009.